I’m late. I know. But the Smashbox x Vlada MUA Petal Metal Collection is still available and it’s freaking amazing. Perhaps one of the best collections I’ve tried this year. So here I am to swatch and review it for my chocolate skin cuties. Because you certainly need to get your hands on this collection before it’s gone! It’s hard to choose a favorite from this collection. I truly love everything I picked! The Rosemantic Highlighter would definitely be a top choice if I had to choose a favorite of the bunch. Rosemantic is a warm deep rose gold with pink and golden shimmer. It pulls a rosy bronze on my chocolate cheeks that looks beautiful! You get just a hint of color but lots glow. Which works like a charm for deeper skin tones. The formula of the Petal Metal Highlighters is what makes them truly divine, though. Rosemantic sports a silky, finely milled formula that’s incredibly soft and blends beautifully. The finish isn’t quite glittery or metallic but Rosemantic still yields a “wet” finish that’s absolutely stunning! There’s 3 highlighters in the collection and I snagged 2 of them. Including Gilded Rose. She’s a soft champagne gold with pink and golden shimmer. Gilded Rose sports the same silky, effortlessly beautiful formula as Rosemantic. However, she’s much more subtle and sheer. So you don’t get quite as much of the base or the dripping wet glow as you would with Rosemantic. Instead, you get more of a soft rose gold glow that’s perfect for everyday wear. Even on chocolate cheeks. The Petal Metal Photo Finish Primer is the true underdog of the collection! And perhaps my favorite piece between a really close tie with Rosemantic. The Petal Metal Photo Finish Primer is exactly like the Photo Finish Radiance Primer. Which may be a little disappointing for some. However, I still enjoy Vlada’s take on the Radiance Primer! The Smashbox Photo Finish Radiance Primer is a real dream come true for dull, dry skin. It gives you an ethereal all over glow that makes your skin look ultra smooth and radiant underneath your foundation. The down side? The original formula comes in a light pearly gold that can start to look a little ashy on dark skin. 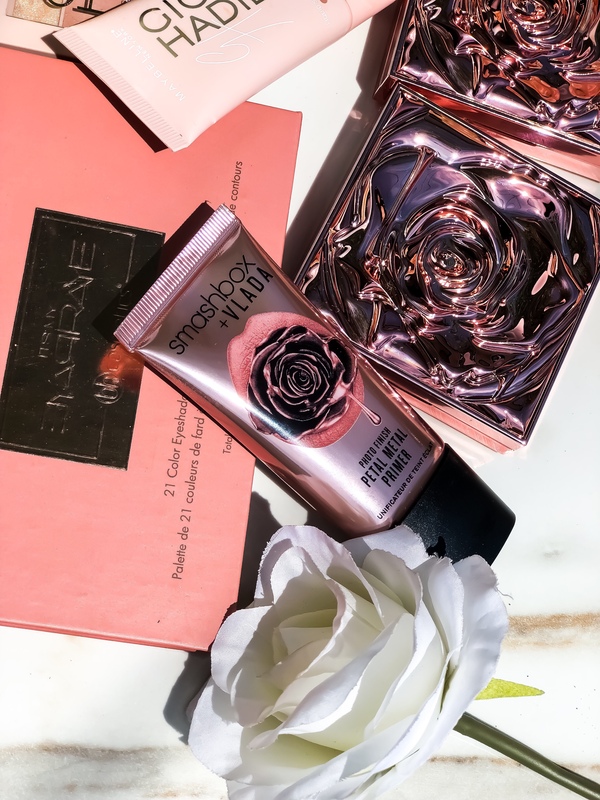 Vlada’s take on the Radiance Primer is a bit deeper and more rose gold. Making the Petal Metal Photo Finish Primer a much better option for dark skin women. The finish is absolutely beautiful! It’s not too sparkly or glittery. So it gives just the right amount of glow without overdoing it. Now if you want to be extra and sparkly and glittery then you’ll love the Shimmer Drops! I picked up Gold Glitz, a glittery mix of gold, pink and silver glitter suspended in a clear oil base. Gold Glitz delivers a ton of glow honey! It’s mostly glitter so you’re bound to glow wherever you put it. However, the oil base seems a bit inconvenient. I wouldn’t really recommend applying the Petal Metal Shimmer Drops on top of foundation as a highlighter. But they work very well underneath or mixed into foundation. I actually love mixing Gold Glitz with my foundation for a killer all over glow and slight hydration boost. Thanks to the oil base. Is the Smashbox x Vlada MUA Petal Metal Collection Worth It? Absolutely! I hate I waited so late to share my thoughts and swatches. But the Smashbox x Vlada MUA Petal Metal Collection isn’t just stunning package. It’s actually great quality! Plus, the colors look amazing on dark skin! I highly recommend checking out the Smashbox x Vlada MUA Petal Metal Collection online at Smashbox, Ulta and Sephora. ← NEW! Milani Soft & Sultry + Pure Passion Eyeshadow Palettes Are Here!